Lynx is wandering and comes into a small town. He accidentally kills an employee of the local warlord. He is then made Reeve by an enterprising old woman and has to survive the wrath of Therien, the man he has bucked. After killing half of Therien’s crew, Lynx proposes a duel of mage pistols at dawn and Therien agrees, knowing that if he kills Lynx, he will then be the legitimate authority in the town. Lynx simply snipes him and heads out of town. This was a story of Lynx before he joined up with the Cards. Honestly, I was expecting a prequel novella to book 3, much like Honour Under Moonlight leads up to Princess of Blood. Seeing what Lynx dealt with as an ex-Hanese soldier wandering around was enlightening and it definitely made him a slighter fuller figure (ha, yes, that is a pun on him being fat). Knowing Lynx from the previous books and novella, I suspected that the ending would go the way it did. Lynx is pragmatic until it runs counter to his set of morals. Sniping a warlord who had used his underlings to try to kill him presented no moral qualms for Lynx. The Cards head to another independent city state ostensibly as bodyguards for the Ambassador, but with Toil telling them to “be prepared”. Some fool scholar has opened a mystery in the city of Jarrazir that leads down into a duegar maze of mythic proportions. Legends hint of a stash of god fragments, but that is odd as the duegar pre-date the fall of the gods. Sotorian Bade, working for the Knight Charnel in his role as relic hunter, leads a force of knights underground to recover the fragments. General Faril is leading a very visible attack against the city to distract everyone from Bade. But Toil isn’t distracted. She has a vendetta against Bade since he left her to die in the Underdark all those years ago. With the very reluctant blessing of the Nobility of Jarrazir, Toil and some of the Cards head underground, along with the surviving student of the aforementioned fool scholar. Now in a race with Bade, both groups will be tested to the utmost in all areas: magic, brains and brawn. Bade successfully carries off the god fragments but Toil realizes there is a greater treasure and the 7 survivors are imbued with some sort of magic that ties them together. Once upon the surface, they must work together, with the remaining Cards and other mercenary groups to throw back the Knights Charnel. This they successfully do. Now Anatim must figure out just what his Cards are becoming and if it’s something he still wants to be in charge of. I enjoyed this as much as the first book. On the plus, there were no “slow” times like I experienced previously. On the minus side, Lloyd goes into perverse immorality here. Sadly, I am letting my enjoyment dictate the outcome instead of dnf’ing this like I’ve done other books with such content. I’m sure it will happen again so I’m already preparing myself for stopping this series at the next such instance. Lloyd likes to write a lot of setup. While the Maze opens in the first pages, neither the Cards or Bade actually go underground until after the 50% mark. It worked this time but there were times I felt like telling him to “get on with the story”. The maze reminded me of the movie Cube, just not quite so spectacularly violent and grotesque. I’m ok with that though. Sadly, the whole time in the maze felt a bit rushed. I do wish there had been more fighting or traps or monsters or something. Less backstory for that wretched Toil and more Maze death. We do find out a little bit of the history of this world and the fact that the gods might have been duegar. My initial thought on learning this was “what is this going to do to the psyche of the people if they learn their gods were nothing but jumped up dwarves?”. I have a feeling Lloyd is simply going to ignore that aspect of things. Just like he’s pretty much not written how the gods being dead and their carcasses being used affects people. This does continue to get the profanity tag as well. F-bombs are used like mage bullets it seems. Lynx and the Cards are taking the winter off, thanks to the money they earned in Stranger of Tempest. However, Lynx gets shanghai’ed into attending a Costume Ball with Toil. When he goes to pick her up at her place, he finds 2 dead assassins, one live assassin and no Toil. Thus begins Lynx’s night. He tracks down Toil using clues she has left behind. Unfortunately for Lynx, Toil is using him to draw out the leader of the assassin group Lynx found in her home. After some good old fashioned torture, there is a showdown in a graveyard and Lynx, Toil and a mysterious stranger in a gold mask take down the assassins. Lynx is left wondering just what the Cards have signed up for in working for Toil. I’m usually not a fan of short stories taking place between books but I wanted to stretch this series out, as book 2 was only released in March. I’ll have to wait at least a year before book 3, so lets make the fun last, you know? Also, my last 2 High Priority reads were real downers. Algorithm of Power and Gods of the Mountain both left me holding an empty dried out husk when I really wanted a juicy watermelon. Thankfully, Honour Under Moonlight gave me a splatterific watermelon of a time! Encompassing 8hrs or less, Lloyd packs a lot of goings-ons into one story. 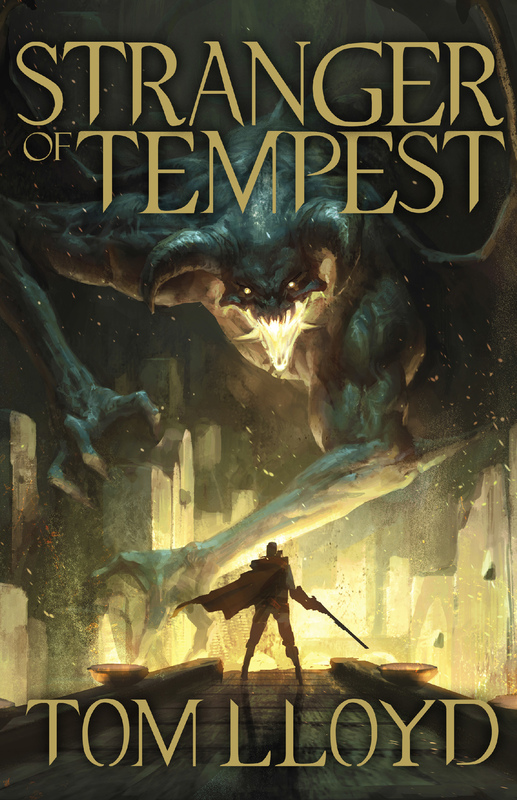 This relies upon the reader knowing what happened in Stranger of Tempest, so this would not be a good starting place. But as an appetizer between main courses, it is delightful. Lynx is as brave, snarky, pragmatic and relatable as ever. It really helps that he’s getting older and fatter. Both of those things I can totally relate too, sadly. I gave the first book the “profanity” tag, as most of the mercs swore like sailors. This time around, only Sitain, who was drunk for most of the story, was the mouthy one. It wasn’t enough to warrant that tag. I have a feeling the next book will return to form though. The action is intense and since this is less than 80 pages, the non-action scenes don’t last very long before we’re up and running again. Or fighting or being tortured. I’d call it High Octane. I have the next book, Princess of Blood, already in the next High Priority slot and I’m hoping to get to it by the end of this month or the beginning of next. Lynx fought in the war. But when his leader’s charisma wasn’t enough to overcome his children’s greed, the war machine imploded and now any soldier who fought on the leader’s side is looked down upon and distrusted by all the surrounding countries. Lynx just wants to retire but without money, he can’t do that. So he hires on with a mercenary group, the Cards. In the process of going to an assignment, Lynx rescues a fellow countryman, a young girl who is a mage, from the clutches of one of the religious orders. The current assignment puts them into direct conflict with said religious order, so the Cards are doubly screwed. Then their contact publicly kills their mark and forces the group to use their most powerful mage bullets to escape the city. The whole Militia of the Order is now after them and the only way to escape is to go underground through Duegar ruins, which are filled with traps and other such creepy crawlies as has driven men mad. Quadruply screwed. In the process of fleeing through the underground ruins, they run into the local scary things, then they run into the Order and then everbody runs into The Big Bad Thing. Yeah, that thing on the cover. It eats magic. 7 times screwed over. The Cards barely survive, make it out and deliver their contact to an out of the way town. She is involved in some nasty politics and after having seen how they conduct themselves, wants to hire the Cards on her master’s behalf without them knowing it. Welcome to the new war boys and girls! I really enjoyed this. The thing I enjoyed most was the magical bullets that the specially built mage-guns could shoot. With names like “icers”, “sparkers”, “burners”, “earthers”, it reminded me exactly of the Moranth munitions from the Malazan Book of the Fallen series. I love those munitions and the kinds of guys who use them, These god fragment bullets (hence the name of the series) had the same vibe as the moranth and I loved every second of it. The second thing I really enjoyed was the balance of worldbuilding and character information with the action. I found that tightrope walked perfectly. I was fed just enough info to keep me satisfied without feeling like Lloyd was info-dumping on me. The action was pretty good too. Mages, magic, mercenaries and whole lot of super creepy, underground, scary creatures that want to, and can, eat you whole. That balrog looking thing on the cover (I’ve included a larger picture you can click if you so desire) is the main “boss” creature but there are plenty of other things too. It’s all good. Thirdly, I liked the characters. Lynx is a great main character. The older I get, the more life experience I have, the more I want the characters I read about to keep pace with me. Lynx is a scarred and broken man and seeing him struggle is encouraging. He can keep on and he hasn’t given up hope. He’s not expecting rainbows and unicorns, but just waking up in the morning to some hot coffee is an anchor point. The rest of the Cards have real potential. One or two of them are already traitors and I suspect their storyline will end in the next book. Hopefully with some appropriately vicious and brutal ending. Finally, the Cards. This whole card scheme once again reminded me of the Malazan Master of the Deck and the Houses and Aspects. You have your suites and then your cards within the suite. So you have the Stranger card. It is in the Tempest suite. Hence the title of the book. In many ways Lloyd got some really cool things without all the existential drama so prevalent in the Malazan books. I LIKE that. The reason I gave this 4 Stars instead of 5 Stars is because of the following two things. First, the profanity. These guys are hardened mercenaries and talk as such. It’s not something I want to overlook though and anyone going into it should be aware. It crossed my radar enough that it became an issue. Second, for whatever reason, when the whole group moved from the town to the underground scene (roughly 40’sh percent of the book), I just didn’t feel the tension the same way. The circumstances were worse, but I never felt like the group as whole was in danger like I did when they were escaping the town and the Religious Order earlier. I can’t put my finger on why exactly and it really makes no sense, but I was able to pin it down to that point. Overall, I thoroughly enjoyed this read. It gave me all the magical fantasy adventure I wanted and was a good standalone story but with the rest of the series taking shape in the background. A lot of potential without overwhelming me with details I didn’t need for this story. Added my “Favorite” tag to this one!